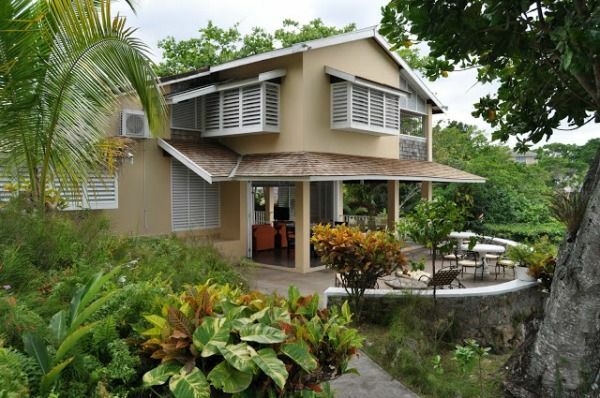 Afterglow (Mamiti Cove) is a beautiful 3 bedroom, 3.5 bath villa nestled in a lush tropical garden overlooking the sea and near to the Sandals Royal Plantation. Built in the early 50's Afterglow, for years one of the most popular villas in Jamaica, is considered a classic Ocho Rios oceanfront villa. After being off the villa market for 3 years, the beautifully refurbished villa is once available to guests and is now known as Mamiti Cove. The villa interior consists of a lovely living room with flat panel TV which open up to the outside with beautiful louvered doors, onto a covered verandah on both the west and sea sides. The sea side of the verandah also acts as the main dining area of the villa affording beautiful water views. The upstairs has three equal sized air conditioned bedrooms with full bathrooms and ceiling fans. Walk in closets, and tasteful decor complete the picture. Two of the bedrooms open onto a lovely second floor covered verandah with outdoor seating. This space looks west out to the ocean and sunsets. Each bedroom features TV, quiet split unit air conditioning, ceiling fans and en-suite bathroom. Afterglow (Mamiti Cove) has an exceptional, experienced staff led by Aldine, the cook, who is legendary in Ocho Rios villa circles. This staff as well as the charms of the villa has built a loyal following of repeat guests over the years. Please note that the villa requires a full 7 night rental all year round except for Xmas/New Years. Located on the second floor and has a king bed, en-suite bathroom with tub/shower, 26&quot; flat panel television. This bedroom offers views of the Caribbean Sea. The bedroom opens to a verandah with sea and sunset views. Located on the second floor and has a queen bed, en-suite bathroom with tub/shower, 26&quot; flat panel television. This bedroom offers views of the beautiful gardens. The bedroom opens to a verandah with sea and sunset views. Located up a half flight of stairs and has a queen bed, en-suite bathroom with shower, 36&quot; flat panel television. This bedroom offers views of the Caribbean Sea.